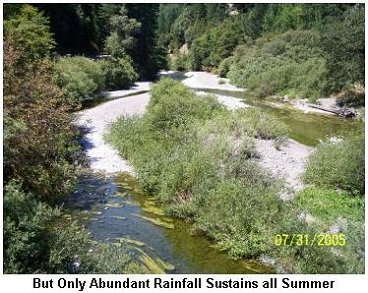 The Gualala River is a mid-size northern California coastal stream. Its coho salmon and steelhead trout have been on (Federal/State) endangered species lists for years. Nevertheless, the present population status of these native fish is unknown, because populations have not been actively monitored or estimated for decades. Because of the dearth of information, in 2001 I began a 10-year population study of steelhead on the river. One aspect of this study is annual wintertime surveys by boat of an 18.7-mile reach of the Wheatfield Fork to monitor spawning populations. 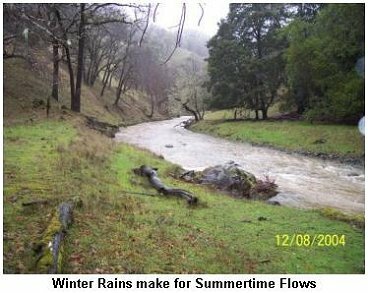 A second aspect is annual summertime snorkeling surveys at various sites to monitor summertime rearing and production of juvenile steelhead in relation to stream flow and water temperature. In addition, in 2007 surveys by helicopter were initiated as a technique to broaden spawning survey coverage and monitor summertime dewatering--one of the river’s most serious environmental problems. The main purpose of this web site is to share study results with agencies, groups and individuals working to recover the river’s ecological health and restore its salmonid populations. 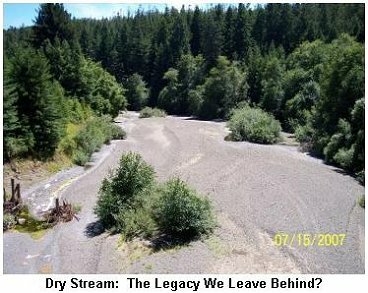 A secondary purpose is to educate the lay public about the river’s plight. Education and public outreach are facilitated through lectures and seminars throughout northern California. View the seminar schedule or arrange a seminar in your local area by clicking here (Seminar Schedule). to the Future of the River’s Steelhead.